56 Medical Construction & Design | NOV EMBER / DECEMBER 2016 | MCDM AG.COM Green news & practices to bring in groundwater at about 53-55 F, and return it to the ground at roughly 65 F. The aquifer is so huge that every building in Missoula could use it for cooling and it wouldn't make a noticeable eff ect on the source temperature." The cooling system that A.C.E. designed stems from redundant, 10-inch bore extraction wells, each 130-feet deep. Each supply well has a 20 horsepower submersible pump. Groundwater moves through the 350 gpm plate-and-frame heat exchanger, and is then returned to the aquifer via an injection well. On the building side of the big heat exchanger, redundant 15 horsepower, VFD-powered pumps circulate a glycol-based solution to rooftop air handling units that supply ducted AC. "We've completed roughly 25 buildings in Missoula that tap the aquifer for cooling," said Swartz. "It's more prevalent here than anywhere in the state, but they're starting to follow suit elsewhere along the western side of Montana, where the water table aquifers are large and easily accessible. Last year, we designed a similar system for a large hospital in Kalispell." Warmth, healing "There's not one pleasant thing about receiving chemotherapy treatments," said Swartz. 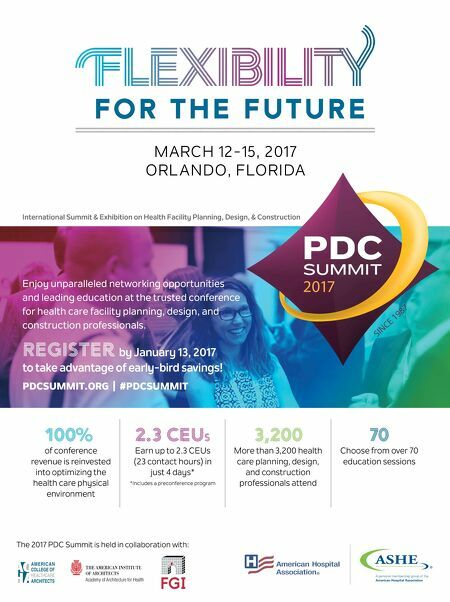 "So a design criterion for the heating system was to make the physical atmosphere as comfortable as possible for patients that will already be uneasy and distressed. The chemotherapy infusion rooms have in-wall radiant panels that provide the fi rst stage heat." For common areas, offi ces and supplemental heat to infusion rooms, high-temp water is pumped to the rooftop air handler and multiple VAV boxes throughout the building. Aff ordable healthcare The fast-fl owing aquifer, which is constantly recharged by the Clark Fork River, is a boon to the Missoula com- munity. When coupled with engineering and mechanical aptitude, it indirectly makes healthcare more aff ordable for those nearby. "The hospital received a $43,000 rebate from the local utility for installing the groundwater cooling system," said Swartz. "But we've calculated that the system also provides an energy savings of around 150,000 kWh per year when compared to a traditional chiller system — meaning an additional benefit of $11,000 or so per year. "Before this building was complete, we enjoyed very high satisfaction with our cancer treatment services, but we wanted a facility that could offer even more," said Devin Huntley, vice president of operations at Missoula Community Medical Center. "With the new facility, we set out to provide the best atmosphere and service possible," said Huntley. "Patients and family members now tell us every day how much they love it. From an administration's perspective, I can honestly say that this is the first project I've worked on in a long time that far exceeded my expectations." The building is positioned to take advantage of the mountain views. Few people who enter the facility know about the natural resource that lies beneath their feet, helping to make the building a reality. Editor's Note: Article submitted by Common Ground, an independent communications fi rm for various businesses and trade associations. Akron Children's Hospital Kay Jewelers Pavilion Honored with Innovative Energy Project of the Year Award CCG Automation, Inc. has received the Innovative Energy Project of the Year Award from the Association of Energy Engineers for the Akron Children's Hospital Kay Jewelers Pavilion project in Ohio. The international award recognizes an innovative energy project which has signifi cant impact to an organization or the community. The new 368,735-square-foot medical tower was completed in May 2015 utilizing the Integrated Lean Project Delivery method. 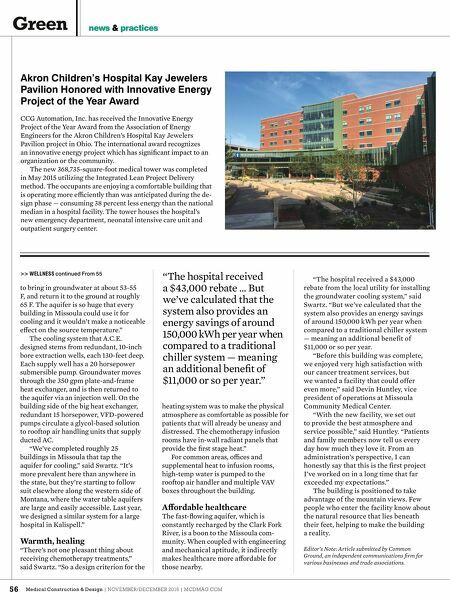 The occupants are enjoying a comfortable building that is operating more effi ciently than was anticipated during the de- sign phase — consuming 38 percent less energy than the national median in a hospital facility. The tower houses the hospital's new emergency department, neonatal intensive care unit and outpatient surgery center. >> WELLNESS continued From 55 "The hospital received a $43,000 rebate ... But we've calculated that the system also provides an energy savings of around 150,000 kWh per year when compared to a traditional chiller system — meaning an additional benefi t of $11,000 or so per year."